Safety aprons are available in all fabrics with your choice of length and closure. 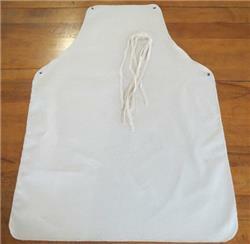 Standard apron closure is snap or eyelet. Please specify any other option desired. 100% cotton. Flame resistant and washable. Protects against flame exposure, light molten splash and sparks, self-extinguishing. 9 to 9-1/2 oz. per sq. yd. FR-7A chemically treated. Offers protection in low heat and light spark applications. Intended to be worn under aluminized clothing when exposure is to high heat or molten splash.